University of Wisconsin-Milwaukee team members say their Solar Decathlon experience has given them a better idea of what to expect after graduation. 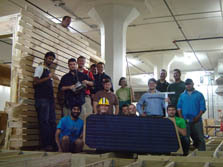 The University of Wisconsin-Milwaukee's Meltwater solar house incorporates numerous waste materials from the construction of the Aldo Leopold Foundation headquarters. 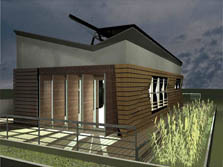 Aldo Leopold, author of the famous A Sand County Almanac, which promotes conservation and nature awareness in his home state of Wisconsin, would be proud of the students on the University of Wisconsin-Milwaukee's Solar Decathlon 2009 team. Their house not only is designed to mimic the glacial-carved lines of their rolling landscape but also is built with materials gleaned from construction "waste"—including some timber planted by Aldo Leopold himself—at the LEED (Leadership in Energy and Environmental Design) Platinum-rated Aldo Leopold Foundation headquarters near their campus. Students say that working with different schools, government staff, and industry professionals has brought a much better understanding of the "languages" people in different disciplines speak and what to expect when they leave the university. The butterfly roof channels water to a reflecting pool, which irrigates plants on the deck. After the competition, a cistern system will be used to water marsh and prairie grasses planted nearby. The team designed windows and a large glass-door wall to bring in natural light and ventilation. A 12-by-7-ft (3.7-by-2.1-m) glass door opens to the west. This seems counter-intuitive for solar heat control, but it allows views of the Washington Monument during the competition and views of the Menomonee Valley in Milwaukee. Materials purchased from the Aldo Leopold Foundation headquarters provide the team's flooring, much of the casework, exterior cladding, and doors. Part of the heating and cooling system, eight temperature sensors take measurements that are averaged together for constant monitoring and adjustment. The house has two heating, ventilation, and air conditioning (HVAC) zones, so adjustments can be made efficiently. The HVAC system includes a heat pump and heat recovery system that can be directly connected to a photovoltaic (PV) panel to run on direct-current power. The house uses efficient solar thermal and PV panels to produce hot water and electricity. A grid-connected, 5.6-kW PV system sends excess electricity to the electric grid. The team worked with Fat Spaniel Technologies to develop a home energy monitoring system that includes a live Web interface to display energy demand and production.